Serving as host for 40 different airlines and making continuous flights to six continents, O.R. Tambo International Airport is the strongest link Southern Africa has to the rest of the world. This makes it the busiest airport in the whole of Africa, serving over seventeen million people every year. This airport was previously known as Johannesburg International until 2006 when it was renamed to pay tribute to the fight of liberation leader, Oliver Reginald Tambo. The services and facilities are of world-class standard, ensuring convenience for each person that enters the doors. This includes easy wheelchair access and the pick-up and drop-off points that make arriving and departing easy. You can also take a convenient train ride on the Gautrain right into the airport from the Sandton Station. 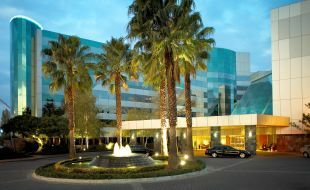 Tsogo Sun offers a choice of excellent Johannesburg airport accommodation to serve as a stopover for those exploring the country or for those travelling on business. 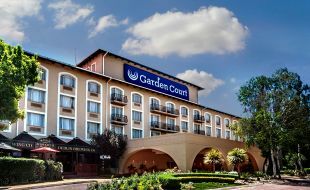 Garden Court O.R Tambo International Airport is your ideal choice if you require a convenient and comfortable hotel close to the airport. Its 253 en-suite rooms offer a range of accommodation options, well-suited to both business travellers as well as those requiring accommodation during their stopover at the airport. 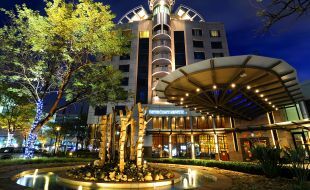 The InterContinental is the premier accommodation choice at O.R Tambo International Airport. Within walking distance from the arrivals hall, relax and unwind from your travels in absolute style at this luxury 5-star airport hotel. This award-winning hotel prides itself on the highest level of service and amenities. 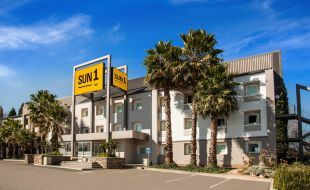 The Southern Sun at O.R Tambo International Airport is a favourite for business and leisure travellers seeking relaxed accommodation at South Africa’s busiest airport. Located only 500m from the airport, you can catch the complimentary airport shuttle to this stylish and comfortable hotel that promises a great sleep and the opportunity to rest and relax before or after your flight. 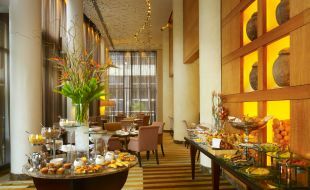 Enjoy a truly African dining experience at the Quills Restaurant at the InterContinental O.R. Tambo International Airport. Appropriately named after the 18m porcupine quill installation suspended from the ceiling, together with a dramatic collage of masks, experience a glimpse into Africa’s beating rhythm at this unique restaurant. Prepare yourself to get a true taste of Africa through the Quill’s interesting and modern take on African cuisine. Choose from a light snack or a succulent main course at Bernoulli’s restaurant at the Southern Sun. Catering to a variety of preferences, Bernoulli’s internationally trained chef offers his guests a wide-selection of indulgent dishes to choose from. Accompany your meal with a bottle of Bernoulli’s finest, world-class wines. Need to unwind after a long flight? Tsogo Sun offers a variety of activities to help you relax whilst you are at O.R. Tambo International airport. Head to the spa to rejuvenate your body after a long trip or relax your mind before boarding. Enjoy a soothing spa treatment at the InterContinental’s Camelot Health Spa or at the Southern Sun, Caroline’s Day Spa. Nothing refreshes the weary African traveller like a dip in refreshing water. Enjoy the option of both heated and outdoor pools at Tsogo Sun’s exclusive hotels at O.R Tambo International airport. Make use of the free 30-minutes worth of WiFi that is available throughout terminals A and B. If you are not travelling with a laptop or mobile device, there are several internet cafés to choose from if you need to access the internet. Skip the queue and save time by checking-in online up to 24 hours in advance of your flight and in the comfort of your home or at your office. There are car rentals available through a number of agencies if you would like to drive yourself around. Another option is the world-class Gautrain and the station is above the central terminal building, making it extra convenient. There are also approved taxi services and bus shuttles outside the arrivals area. For your own safety do not accept just any taxi service, make sure that the taxi you use has the ACSA logo on their vehicle – this means it is an approved operator. Do not leave valuables, like a laptop, unnecessarily out in the open, rather keep them well-hidden.